Major part of Endodontic treatment involves Root canal treatment and for a successful Root Canal treatment, you need proper access opening which is number one rule taught in every Dental school. Paul Krasner (DDS) and Henry J. Rankow (DDS) have given Guidelines or Laws which will help any practicing Dentist to obtain proper access opening and to locate the pulp chambers easily. The first and most important part in the success of a Root Canal treatment procedure is to determine the number and location of all the pulp chambers present in the tooth. Kransner and Rankow also mentioned certain important points by pointing out the Relationships of Pup Chamber to Clinical Crown and to the Pulp-chamber Floor. Having knowledge of these helps in preventing any perforations and also helps in getting mental picture of the location of the pulp canals. Law of Centrality: The floor of the pulp chamber is always located in the center of the tooth at the level of CEJ (Cemento Enamel Junction). This law helps in determining the depth to which you can go without causing any perforation. You can use an IOPA X-ray or just place the bur against the tooth and measure it against the Bur length to have an idea of the depth to which you can extend in search of the pulp orifice. Law of Concentricity: The walls of pulp chamber are always concentric (or around the pulp chamber following its shape) to the external surface of the tooth at the level of CEJ. Law of CEJ: It should be used as a landmark to locate the pulp chamber as it is repeatable and consistent in its position in any tooth. Law of Symmetry 1: Except for maxillary molars, the orifices of the canals are equidistant from a line drawn in a mesial distal direction through the pulp-chamber floor. Law of Symmetry 2: Except for the maxillary molars, the orifices of the canals lie on a line perpendicular to a line drawn in a mesial-distal direction across the center of the floor of the pulp chamber. Law of Color change: The color of the pulp chamber floor is always darker in comparison to the vertical surrounding dentin walls. Law of Orifice location 1: The orifices of the root canals are always located at the junction of the dentin walls and the floor of the pulp chamber. Law of Orifice location 3: The orifices of the root canals are located at the terminus of the root developmental fusion lines. These are the observations seen in relevance to all the teeth, Permanent Anterior and Posterior alike. 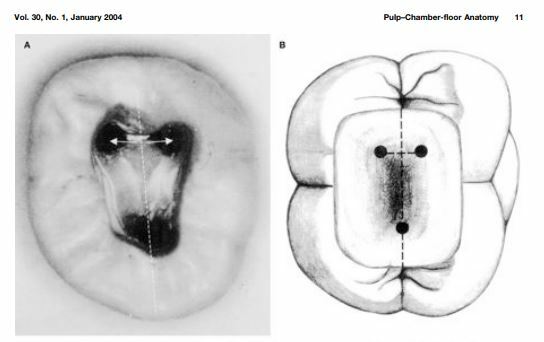 A total of 500 extracted Permanent teeth were used to observe the anatomical patterns to help decide the relationships of the pulp chamber to the clinical crown and to help dentist have a mental picture before hand to proceed with access opening. 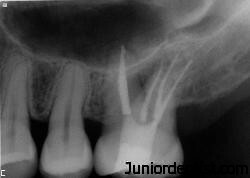 The pulp chamber was always in the center of the tooth at the level of CEJ. Here they have mentioned the distinct points which help in demarcating the pulp orifices in relation to the pulp chamber floor. Pulp Stones or Pulpal calcification are usually lighter in color than the pulp chamber flow and mostly obstruct the access opening. It is important for all clinicians to follow all the above mentioned laws to obtain the perfect access opening which is not defined but different to each tooth and its varied anatomy. In case of inadequate knowledge of Pulp Chamber anatomy it leads to Endodontic failures. It is almost impossible to determine the exact location of the root canals until the access opening is done and having proper knowledge of the pulp-chamber-floor anatomy. In the end it is the clinical expertise of the Dentist which helps in success of an Endodontic treatment aided by adequate anatomical knowledge of the Root Canal System. With the study published 15 years back, it still holds its ground on providing the basic knowledge to the clinician to get proper access opening. Source: Anatomy of the Pulp Chamber – Journal of Endodontics, Vol 30, No 1, January 2004.